This Rumble ended on 2003-11-01 00:00:00.0. Off Time: Spent planning raids or practicing fighting skills. Philosophy: Do whatever is necessary for the species to survive. Education: Reading, writing and military tactics. Society: Female draconians are protected and cared for at all costs. Dark Leaders: Black armored relentless humans that force them into fighting for them. Philosophy: To survive one must gain as much territory as possible. Education: Taught that all other beings are inferior. Society: Female orcs are considered possessions. Dark Leaders: Black-skinned subterranean elves that manipulate them into fighting for them. Of all of King Obould Many-Arrows weapons his greatest was his mind. He knew how to exploit a weakness. How to shape a battlefield. As he looked down from the mountains to the walled city that had appeared from the mist at the base of his kingdom he wondered at it’s occupants. His spies that had snuck up on the keep had seen glimpses of strange “dragon men”. The king wondered if perhaps it was some arch-mage that had transported the city into the orc’s realm, dumping his own problem into the king’s front yard. No matter, he thought. No one city could every stand up to the might of his army. Kang looked over the battlements at the new mountains that seemed to have risen over night near the walled city of Teyr. Initial reports from his spies in the field were that their appeared to be a mass of goblin types creatures hiding among the rocks above them. Kang quickly ordered all the citizen draconians to the bastion at the center of the city and deployed troops along the walls. He wasn’t sure what to think of what had happened. Perhaps the gods had finally considered draconians and abomination and removed them from the face of Krynn. Well whatever happened Kang was not going to give up with a fight. The draconian governor gathered together a patrol of 100 draconians and sent them out the front gates to test the reaction of the “goblins”. The orc king watched, impressed despite himself, as 100 of the dragon men marched onto their field. Their precision and training was remarkable. Jealously King Obould began issuing his own orders. Never one to give an enemy an even chance the king ordered 10 orcs for every dragon man to descended into the valley and crush the opposition quickly and decisively. 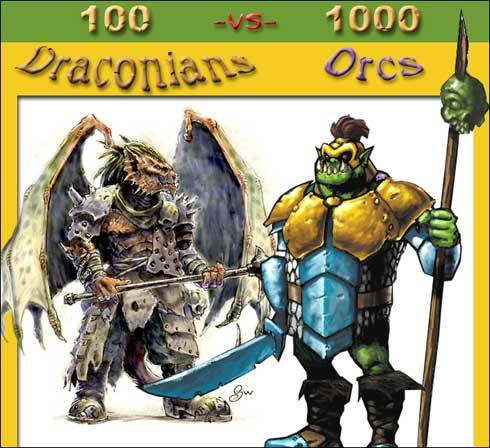 1000 orcs versus 100 draconians. The fight has just begun.